Nacre, also known as mother of pearl is a composite, organic-inorganic material produced in nature in the inner shell layer of molluscs and the outer coating of pearls. The material is resilient and iridescent with high strength and toughness, resulting from its brick-and-mortar-like architecture. Lightweight and strong materials are of interest in materials science due to their potential in multidisciplinary applications in sports, aerospace, transportation and biomedicine. 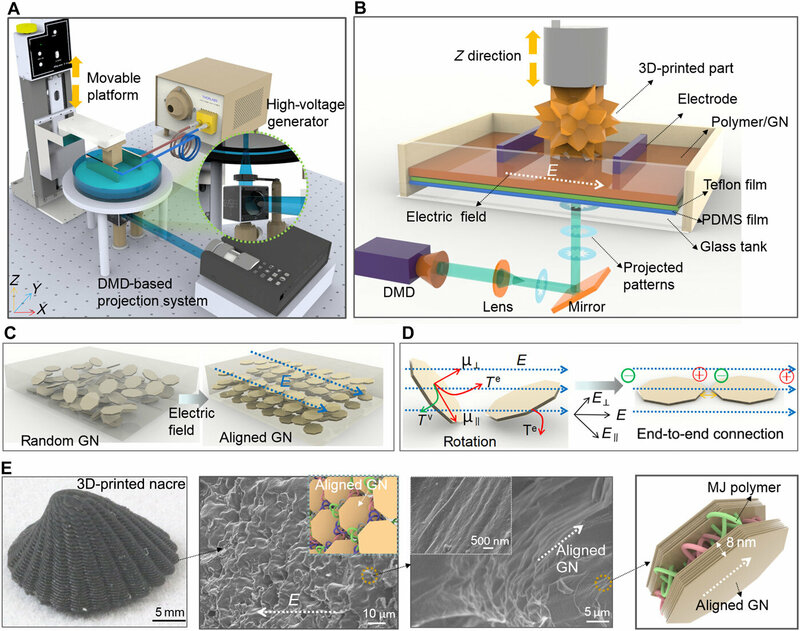 In a recent study, now published in Science Advances, Yang Yang and co-workers at the interdisciplinary departments of Systems Engineering, Chemical, Biomedical and Aerospace Engineering at the University of Southern California, developed a route to build nacre-inspired hierarchical structures with complex 3-D shapes via electrically assisted 3-D printing. This outstanding materials property formed the basis to design light and strong armor for microstructural interfaces in materials science. Although traditional, bottom-up assembly processes such as vacuum filtration, spray coating, ice templating and self-assembly were previously studied intensively to build nacre-inspired architectures, the methods only focused on two-dimensional (2-D) thin-film formation or simple bulk structures. Since it is challenging to use these techniques to develop 3-D architectures – 3-D printing (additive manufacture) is a powerful alternative. Recent studies in materials science and bioengineering have used 3-D printing with shear forces, magnetic and acoustic fields to form reinforced composites with aligned fibers.